Western blot analysis of extracts from various cell types using Cool2/αPix (C23D2) Rabbit mAb. 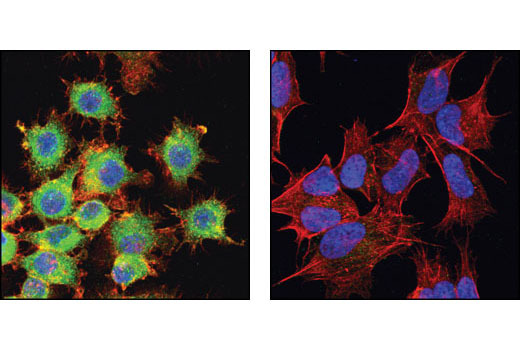 Confocal immunofluorescent analysis of RAW 264.7 (left) and SH-SY5Y cells (right) using Cool2/alphaPix (C23D2) Rabbit mAb (green). Actin filaments have been labeled with DY-554 phalloidin (red). Blue pseudocolor = DRAQ5™ (fluorescent DNA dye). 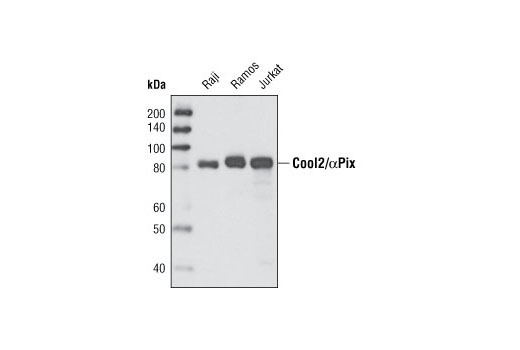 Cool2/αPix (C23D2) Rabbit mAb detects endogenous levels of total Cool2/αPix protein. Monoclonal antibody is produced by immunizing animals with a synthetic peptide corresponding to residues near the carboxy terminus of human Cool2/αPix. Cool/Pix proteins comprise a family of guanine nucleotide exchange factors (GEFs) localized to focal adhesions. The family consists of two isoforms, cool2/αPix and cool1/βPix, the latter having two splice variants that vary in their carboxy termini (1). Cool2/αPix, like other GEFs, has a DH (Dbl homology) domain, which allows binding of small GTPases and GDP/GTP exchange, and a PH (Pleckstrin homology) domain (2). X-chromosomal genes mutated in nonspecific mental retardation (MRX) comprise a family of genes, including the gene encoding Cool2/αPix, thought to be involved in mental retardation (3,4). Cool2/αPix interacts with β-parvin/affixin, a protein involved in integrin signaling (5), and may act downstream of integrin-linked kinase (ILK) to regulate actin reorganization and cell spreading (6). When Cool2αPix exists as a dimer, it functions as a Rac-specific GEF, whereas the monomeric protein acts as a GEF for both Rac and Cdc42. Regulation of Cool2/αPix dimerization, and therefore its specificity, occurs at least in part through p21 activated kinase (PAK) in response to extracellular signaling (7). Further, binding of Cdc42 enhances the Rac GEF activity of the Cool2/αPix dimer. Activated Rac in turn inhibits Cool2/αPix Rac GEF activity (8). Kutsche, K. and Gal, A. (2001) Cytogenet Cell Genet 95, 196-201. Kutsche, K. et al. (2000) Nat Genet 26, 247-50. Lower, K.M. and Gecz, J. (2001) Am J Med Genet 100, 43-8. Rosenberger, G. et al. (2003) Hum Mol Genet 12, 155-67. Filipenko, N.R. et al. (2005) Oncogene 24, 5837-49. Feng, Q. et al. (2004) EMBO J 23, 3492-504. Baird, D. et al. (2005) Curr Biol 15, 1-10.